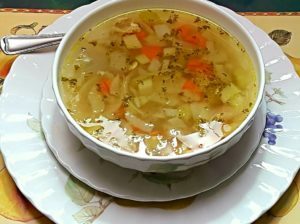 One of my favorites things on a cool rainy day is a nice big steaming hot comforting bowl of homemade chicken soup. The aroma of chicken soup simmering takes me back to childhood. Mom made the best soups! There is always so much more flavor and nutrition in soups you make at home! Controlling the sodium is one of the important healthy improvements that can be done at home. That is important for everyone’s health. Soup is one of the easiest foods to prepare. This super simple modern style chicken soup doesn’t start out with a whole chicken. Yes, I can break a whole chicken down to make it, but it’s not my favorite thing to do. I love using chicken thighs with the bone in and skin on because there is a lot more flavor in those parts. Thigh meat doesn’t dry out as easily as white meat. Once you prepare homemade soup, your palate will tell you there is no going back to canned soups. You get a ton more nutrition in homemade soups and other foods and it is made to your taste and health requirements too. When the soup is done it’s easy to pull the chicken pieces out to remove the skin and bones and cut into spoon-size pieces and can be done the next day or before serving. Leave a small amount of the chicken fat in the soup but see below on how to take most of the fat off. Scrub and chop dice celery into pieces about the size of the carrots. 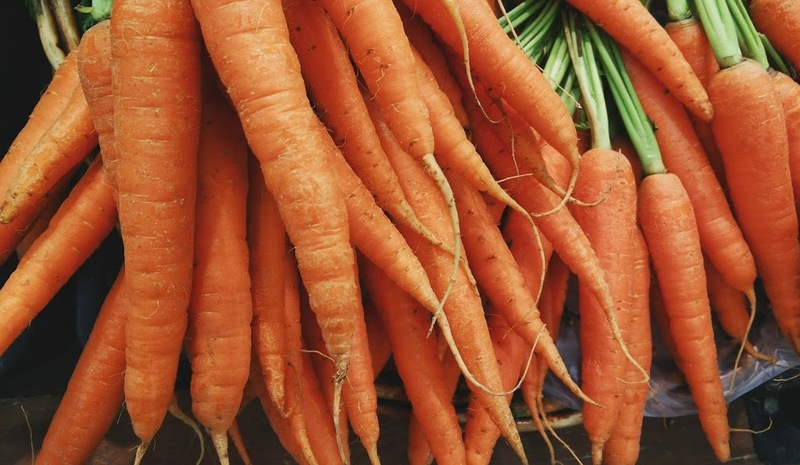 Set carrots and celery aside. Peel and dice the onion into a medium to small dice. Chop the parsley fine including the stems. 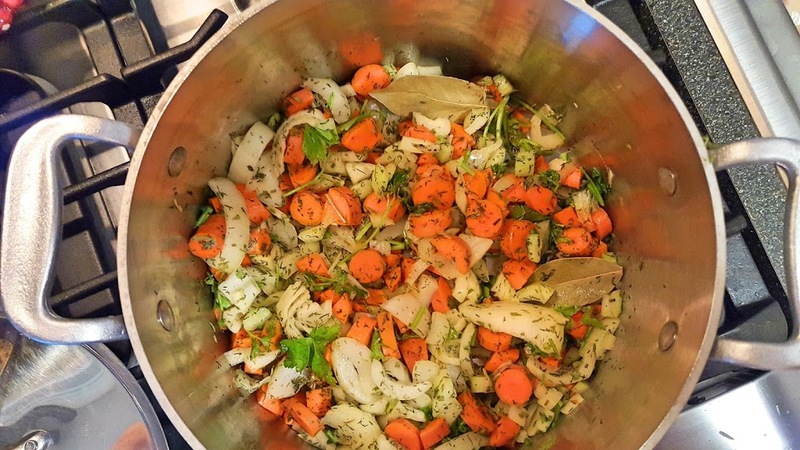 The parsley stems add a lot of heartiness to add to the finished soup.If you don’t like chopping the stems, then take the stems into a bunch and tie with cotton kitchen twine for easy removal. 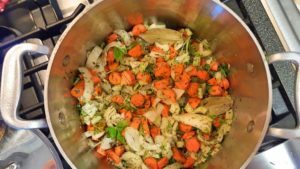 Into the stock pot or Dutch oven add the flavorless oil and on medium heat sweat the onion, carrots, and celery for a minute or two. Add the chicken to the pot and over a very low flame heat to a simmer for 60 minutes minimum. Check for flavor. If you want a heartier broth, let is simmer lid off a bit at this point to reduce the volume. This reduction needs to be before adding the salt and pepper. If you’ve used the bone in chicken thighs, remove them from the pot and cut or shred the meat to small soup spoon sized pieces. Chicken soup should have some of the fat still in the broth since fat is flavor. Small amounts of fat will keep the hunger pangs away longer too. Our brains do need some fat to work well also. Defatting the soup of huge amounts of fat is a good idea and it’s very easy to do. The best and easiest way to remove the excess fat is simply to chill the soup overnight. Fat congeals to a layer on top of the broth and then can easily be lifted off. I can be lazy or an in a hurry cook many days so I often just add the uncooked Israeli couscous to the stock pot and cook for about 10 minutes. Adding the couscous works well in soups. Because I prefer the larger Israeli type, that stays round, firm and doesn’t cloud the broth. Any other soup noodle or rice should be cooked separately and just added to the bowl before ladling in the soup. For Freezing: This soup can be frozen in portions and I recommend using a small sandwich bag to freeze separately any noodles used so they don’t cloud the soup or drink up all the broth. As they always said in my children’s school…Bon Appetit, you may eat!